Girls (minus one) On The Run ..
That’s the final answer from my ten year old about taking part in this springs Girls on the Run race here in Madison. We’ve gone through the spring program. She has done relatively well. Given running more of a try. Made some new friends. I’m just happy she continues to try new things that have her staying active, involved and getting some exercise. But after telling me the past few weeks she wants to do the run while telling her father no she wants nothing to do with it, we’ve made a decision. There will be no running the 5k this weekend, the race that is supposed to be the culmination of a spring of training.. While I feel sad about that and feel strongly she should finish out the program, because the feeling of crossing a finish line and the rush of having done a race, no matter the pace or how much pain you may be in, is wonderful and inspiring ..
Or while I worry that instead of digging deep when the going gets tough, she instead on many occasions chooses to, I believe, give up or act like she isn’t interested .. While it gives me one more reason to be concerned she often defaults to what she feels mom or dad want her to do versus what she feels she wants to do ..
I’m happy that she signed up and went through the last few months of an incredible program. That she chose to participate twice a week in a program that had her not only exercising, but also in a social setting where adults and kids have a safe environment to discuss some of the challenges that come with being in that age group, 3rd-5th grade. That she felt at times, stronger for trying something she wasn’t sure she could do. And still isn’t. But that she may be more apt to give a shot in the future. That there is such a program out there to help families and communities build strong young women, who could very well go on to become leaders. Who run. Or who don’t. But who know the value of working hard toward a goal and that feeling of crossing a finish line on any project one sets their mind to. That she got her feet wet in a/another sport that teaches individual hard work is just as important to a team .. as a team working together to get things done. She may not be running the race this weekend .. but that’s okay. I’m hoping, if nothing else, the lessons GOTR also offers each practice will give her more confidence all around, a better feel for path she is on in life, and the pace in which she wants to run it. 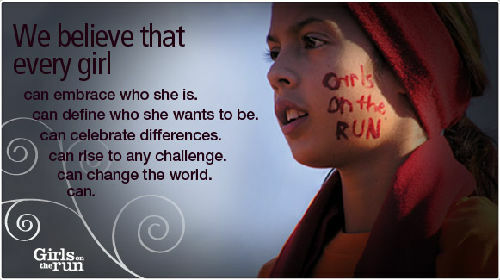 This entry was posted in Children, Daughters, Family, Girls on the Run, Lessons learned, Life, Running, Uncategorized and tagged Dane County, Daughters, Girls on the Run, Lessons learned, Not doing the race, Preteens, Running by Carleen Wild. Bookmark the permalink. Nice post. She’ll be better for the experience of the program for sure, and for her parents who let her make the final decision!